Enhancing women’s skill and knowledge through a targeted extension system is a prerequisite for achieving the goal of gender- and nutrition-sensitive agriculture. However, efforts in this direction are few. Dr Surabhi Mittal explores these issues in this blog. Empowering and educating women has positive implications for children’s health and nutritional status, which in turn influences the demographic dividend, and that is what India aims to harness in the medium to long run. Many experts consider women to be at the nexus of agriculture, health and nutrition, and thus gender and nutrition are increasingly being viewed as priority areas for research and extension. 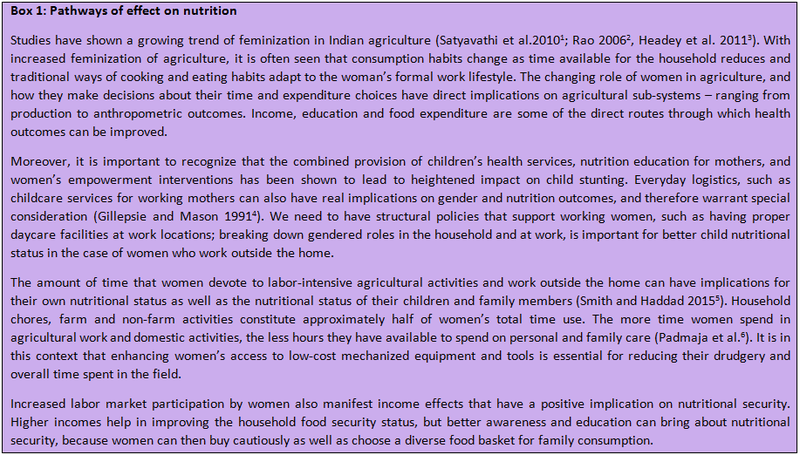 Women often hold dual roles as consumers and food managers at home, influencing intra-household management of both food and nutrition security (Box 1), as recognized by India’s National Food Security Act (NFSA). They also play a substantial role as producers, and contribute a significant share to farm labor all over the world. It is important to find ways to mainstream gender in nutrition into the field of agriculture, so as to create gender and nutrition linkages in the food systems. 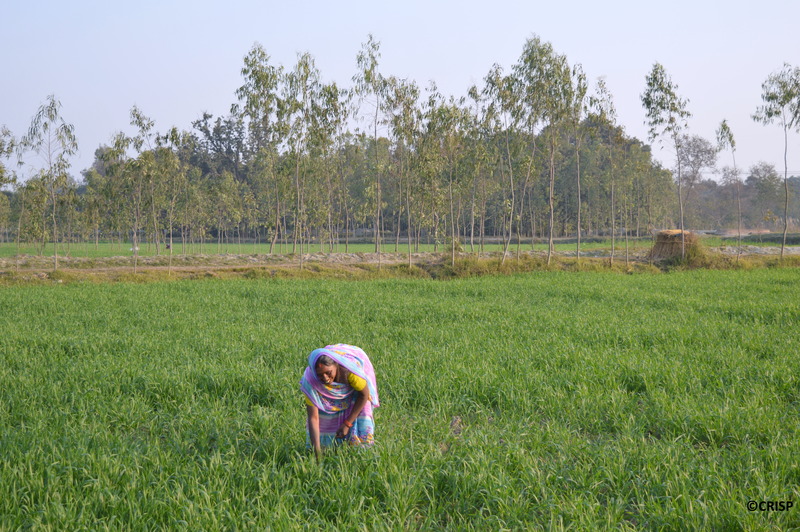 Thus, in this blog we present a discussion around how women’s involvement in decision-making and time-use in agriculture influences the nutritional status of the household. We also discuss how extension can play an important role in women’s empowerment and behavior change for improved nutritional outcomes. Even if women are playing an active role in agriculture, it is often found that their involvement in the decision-making process on various agricultural activities is very limited. It is often cited that a lack of access to information sources, new technology, credit facilities and proper training limits the decision-making capacity of women (Mittal 2016 ). These factors also have an impact on aspects related to food and nutritional security. Women’s role is also important in meeting the cultural needs of food consumption and preparation within the household. Empirical evidence shows that household consumption patterns, and mainly that of women in the household, change during times of crisis and uncertainty. Women tend to prioritize the food intake of the elderly and children before themselves during food shortages caused by factors like variations in household income and seasonal availability of food products. Therefore, it is important to improve the affordability of nutritious foods by ensuring their year-round availability, and by limiting the impacts that price shocks can have on household incomes. Increasing the quantity of food available at the household level does not always guarantee improvement in nutritional status, since the latter depends as much on the diversity and quality of food as on its availability for consumption and the intra-household distribution of that food. For this reason, enhancing women’s understanding of nutrition and why it is important to have a nutritious and diversified diet, as well as encouraging behavioral change towards self-consumption are critical to achieving positive nutritional outcomes. Reaching out to women, however, warrants a differentiated communication strategy on nutrition for different age cohorts (such as for school going girls, adolescent girls, young women attending colleges and universities, young women in the reproductive age cohort, and other older women). Access to income and equal employment opportunities for women enhance the household’s access to food and nutrition. A fundamental step forward in that direction involves removing the constraints faced by women with regard to their access to information, dissemination, and extension facilities. Information asymmetries tend to limit the ability of women farmers to harness the potential of agriculture, as they often do not have access to the appropriate technological know-how and inputs, as well as information on weather patterns and best agronomic practices. 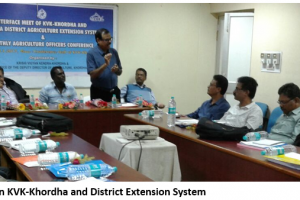 In this context, the roles of extension services become significant. Extension agents often fail to reach out to women farmers due to structural impediments such as staffing and funding shortages that make it difficult to reach resource-poor, remote farms (as women’s barriers to credit and land titles usually leave them with marginal lands). Existing cultural and social barriers also discourage women farmers from interacting with male extension workers. Enhancing women’s skills and knowledge through extension systems is a prerequisite for increasing their decision-making capacity and income, which lead to better nutritional outcomes. Within agriculture extension services, agri-nutrition-related education and communication have a very critical and important role to play if we want food security to translate into nutritional security and gender empowerment. Extension has a facilitating role in multi-sectoral convergence for leveraging agriculture with regard to nutritional security and gender empowerment. Information and Communication Technology (ICT), together with traditional media, offer a platform for promoting extension for agri-nutrition. Although extension services in India have started integrating modern ICT tools to disseminate information, yet gender bias exists due to poor access of women to these resources. Nutrition-sensitive information is still not a mandate for the extension system of India. It is necessary to deviate from just the conventional information about staple crops and agronomic practices and include information that incorporates a diversified production system. For example, to enhance household nutrition, it is important to promote labor-saving technologies and a variety of allied activities, such as kitchen gardening, wadi (orchard), livestock, poultry, and fisheries. This can help in creating gender-driven diversification of production activities. Studies, suggest that there is need to update the curriculum of extension agents so as to integrate such information into their training. The current curriculums taught to extension agents in the state agricultural universities do not integrate the agriculture and nutrition linkages. Nutrition-related extension is done through the Ministry of Women and Development and they focus largely on women’s health aspects. 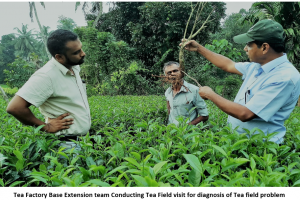 The agricultural extension system needs to be linked more closely with the health extension services so as to create extension material that is relevant for nutritional improvement in the agricultural sector. 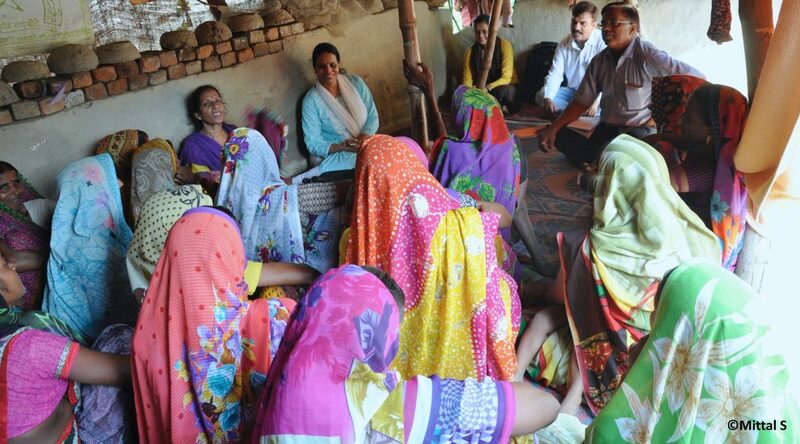 Self-Help Groups (SHGs) have been a successful platform for initiating behavioral change – by educating and empowering women to increase their incomes and economic opportunities. These groups emerge as potential change agents for creating an enabling environment that can enhance women farmers’ access to technology and related inputs. SHGs can be leveraged and institutionalized to enhance capacity and employment opportunities in agriculture; examples of such are ‘Kudumbashree’ in Kerala, and ‘Jeevika’ in Bihar. Extension can play an important role in developing entrepreneurship among women. There is a need for transforming and graduating from micro-credit to micro-entrepreneurship, taking advantages of the SHG network and using it as platforms for extension education. There is an obvious and glaring disconnect between agriculture and nutritional security. Bridging the gaps between agriculture, nutrition, and gender empowerment will make a major contribution towards achieving the goal of freedom from malnutrition. Women play an important role in ensuring both food security and nutritional security in the family as they are producers of food and also because they play an important role in food management. Empowering them to make informed decisions and recognizing their role in this process can help solve some of the challenges related to nutritional security. There is a need to invest in the development and distribution of time-saving farm technologies to reduce women’s drudgery as this will help to improve labor productivity and limit women’s time in the field. This will help improve her and her family’s nutrition by allowing them to spend more time on activities like child care and food preparation. There is need to ensure that extension services and extension tools and materials are gender and nutrition inclusive. Enhancing women’s skill and knowledge through a targeted extension system is a prerequisite for achieving the goal of improved decision making in the context of increased feminization of agriculture. Farmer-to-Farmer extension programs can be more focused on engaging women lead farmers, who can then reach out to other women farmers. 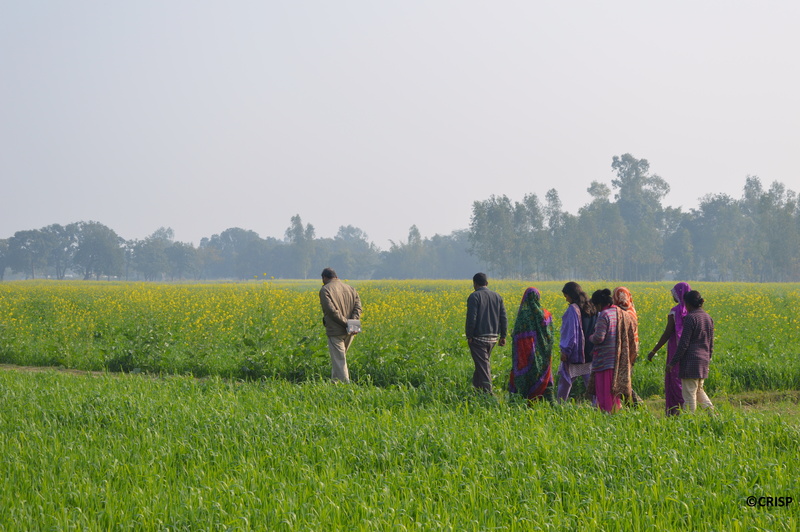 This blog is derived from a discussion at a special session titled “Engendering Food Systems for Improved Nutrition,” at the Agricultural Economics Research Association’s 24th Annual Conference on December 16, 2016, which was co-hosted by TCI-TARINA and the International Food Policy Research Institute (IFPRI). The discussion was led by distinguished panelists R Padmaja, Senior Scientist, International Crops Research Institute for the Semi-Arid Tropics; Dimple Tresa Abraham, Research Associate, Center for Women Development Studies; Krishna Srinath, retired Director, Central Institute of Women in Agriculture; Prabhu Pingali, TCI-TARINA and Cornell University; Surabhi Mittal, Senior Economist and Coordinator CoE, TCI-TARINA; Mamata Pradhan, Doctoral Candidate, University of East Anglia; and Premlata Singh, Head – Extension, Indian Agricultural Research Institute. Satyavathi CT, Bharadwaj C and Brahmanand PS. 2010. Role of farm women in agriculture: Lessons learned. Gender, Technology, and Development, 14(3): 441–9. Rao EK. 2006. Role of women in agriculture: A micro level study. Journal of Global Economy 2(2), 109–123. Gillespie S and Mason J. 1991. Nutrition relevant actions: some experiences from the eighties and lessons for the nineties ACC/SCN State-of-the-Art Series. Nutrition Policy Discussion Paper no. 10. Geneva: United Nations. Smith LC and Haddad L. 2015. Reducing child under nutrition: Past drivers and priorities for the post-MDG era. World Development 68:180-204. 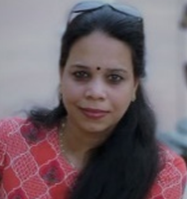 Dr Surabhi Mittal is an independent consultant and non-resident fellow at Tata-Cornell Institute.